Due to the rapid spread of electric illumination, our world is not as dim at night as it was 130 or even 70 years ago. Nightlights of constantly increasing intensity and bluer in color, which illuminate our streets and public spaces today, are captured by satellite sensors and transmitted to the earth as digital images. 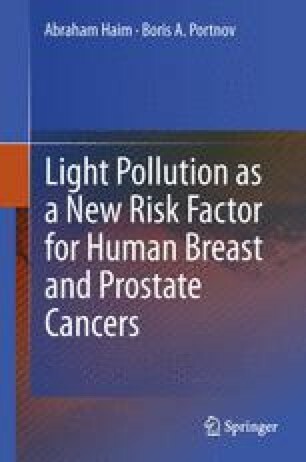 In this chapter we discuss two case studies, which attempted to link the above digital maps of nighttime illumination with BC&PC incidence rates, thus helping to demonstrate a potential association between them. Lighten the darkness of the night with the light of day. The day is approaching that is neither day nor night.